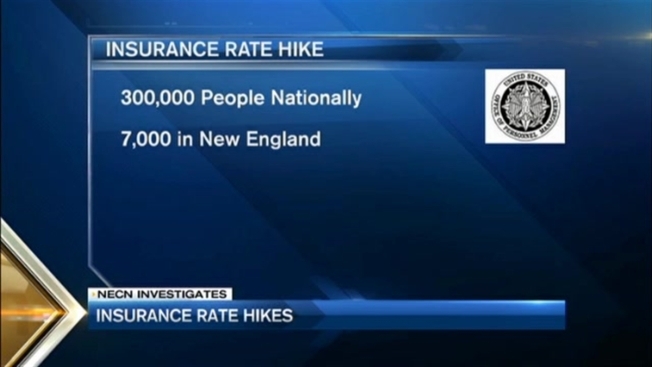 Later this year, 7,000 New Englanders will see their insurance rates dramatically rise. "A promise was made and a promise was broken," said Christiane Wolff. She, along with thousands of other people who purchased Federal Long Term Care Insurance (FLTCI), could see their rates rise by 120 percent. Enrollees like Wolff will be able to use their insurance to cover the future costs for nursing home care and long-term care facilities. The Office of Personnel Management (OPM) which oversees the FLTCI program began notifying affected customers in July. Wolff received her letter last week. She says she was shocked to see her premium skyrocket from $289 to $654. "I had searched other plans and they were just too expensive for me," said Wolff. "Everything I've ever worked for, I don't want to lose it. You need someone to care for you and you can always depend on your family." OPM told necn Investigates the program is contracted through John Hancock. Every seven years, OPM issues a new contract and this year John Hancock was awarded the contract. The new premium rates will go up as of Nov. 1, 2016. "It's shocking," Rep. Steve Lynch told necn. "For a lot of people, having this 100 percent increase or 120 percent increase is making it unaffordable." Lynch says that more than 300,000 people nationally are impacted by John Hancock's decision to raise rates. John Hancock declined necn's request for an on-camera interview and forwarded the request for comment to OPM. "As is occurring across the industry, rates are increasing," OPM said in a statement. "To address the financial impact of the increases on affected enrollees, OPM has worked with John Hancock to provide them with different policy options to help mitigate or offset the effects of any increase in their premiums." However, necn Investigates has learned in order for enrollees to keep their premiums the same, they would have to reduce their coverage limits. "I certainly can't afford the $654. I'm just going to have to drop to the rate I'm paying," said Wolff. Lynch told necn when Congress returns from recess in September, he will take action. "We're going to have to have Congressional hearings to figure out, how did the insurance companies with this number?" explained Lynch. "How much of a profit is in that premium increase?" To find out if you're impacted, you can click here.